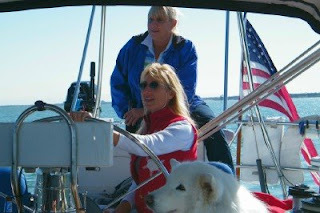 Saturday we were invited out to sail (drift) by our friends Bill and Jan on their boat Merlin. It's a 50 ft center cockpit that's all decked out for fun including a wet bar. Jan had a friend and her husband in town for a conference, Terri and Bill. 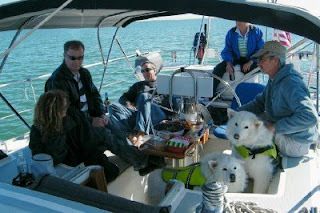 The crew for the day was rounded out by their two beautiful Samoyed's, Alley and Bravo. 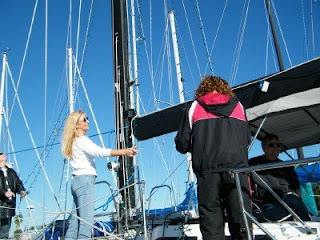 The day was cool, never reaching above 60ish with winds from 0 to 4 kts. The bay was flat with ruffles to glassy. A perfect winter day to go out and drift around with friends. 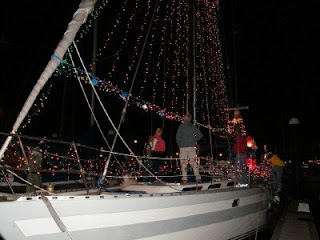 We ghosted around for a couple of hours and then went back to the slip and got busy with the real reason we were invited to this event... the decorating of the boat for the Annual Harbor Lights Boat Parade. The women prepared the light strings down below from the literally hundreds of strings. 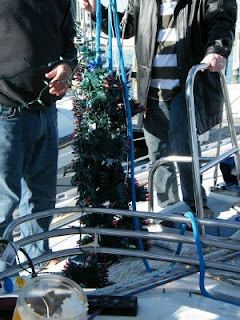 Bill had a plan... we passed up the light bundles and he carefully labelled and strung them on a hallyard to be hoisted to the top of the mast where he had placed a lighted star. Even Bruce was gung "Ho Ho HO!" It was a well thought out plan... it all went like clockwork...Everyone had a part in holding the strings just so that they would go up without becoming a tangled mess. 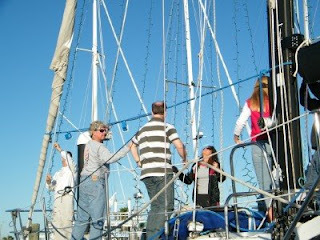 Once the lights were up to the top of the mast, they were fastened to a line Bill had prepared with power plugs all along the way. 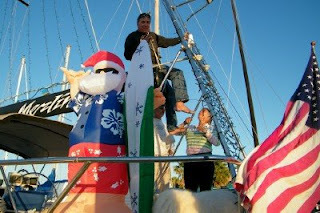 The next step was to set up the giant Surfing Santa with a "light wave" on the back deck of the boat. 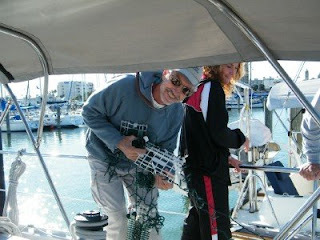 The last steps were wrapping the lifelines with miles of light strings and setting up the bubble machine to leave thousands of bubbles in our wake as we motor along. The generator would be busy tonight. Bill had warned us all to dress warmly in layers because all of the power would go to the lights leaving none for heat. I snuggled up to Bravo... these dogs were the perfect pet for the festivities. 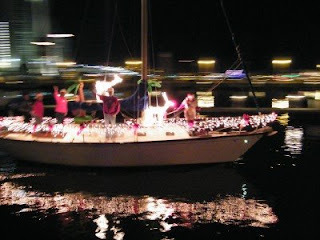 Of course the pictures of the boat parade were freaky looking. We got the best view of all of the other boats. 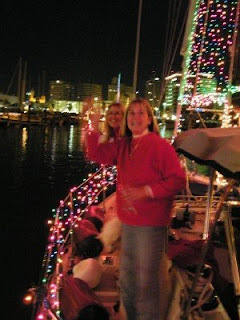 We had a great time dancing on the deck waiving to the spectators while the Beach Boys blared over the hailing speaker. 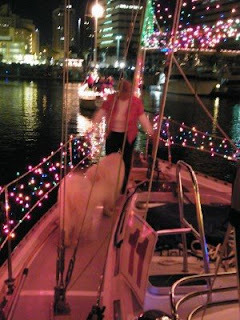 Jan got the dogs excited enough to dance with her. They were a hit with the crew and with the crowds! This is the best I could do of the boat and it doesn't do it justice. We had the greatest time! Thank you so much Bill and Jan for the invite. Once again Bruce and I marvelled at how our days seem to fill with such treats as we couldn't have imagined at the outset... like magic! 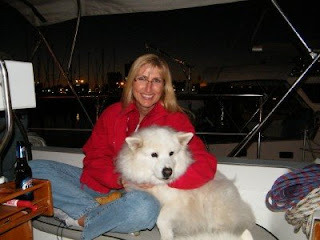 I am in LOVE with those dogs. They are so beautiful.